Youth-Led Innovation for the SDGs #1: What Are the Challenges and Opportunities? Preluding the High-Level Political Forum 2017, SDSN Youth and The Social Investment Consultancy created a policy brief outlining concrete recommendations for key stakeholders (including amongst others impact investors, policy-makers, universities and societies at large) to advance youth innovation for achieving the Sustainable Development Goals (SDGs). Here follows the first post in a series of three outlining how to support youth-led innovation for the SDGs. When the Sustainable Development Goals (SDGs) were launched in 2015, they threw down the gauntlet to all of us to enact ‘a plan of action for people, planet and prosperity’, and collaborate to overcome our planet’s greatest challenges. This stated commitment to include everyone in creating and implementing solutions to these challenges goes beyond a global spirit of inclusivity: in fact, in order to stand any chance of achieving these goals, it is incumbent upon us to promote mass-scale participation, and work to empower communities that have historically been marginalised or silenced. In recognition of this, the UN 2030 Agenda has embraced the crucial role that young people can and should play, especially given the increasingly young global population, and the pool of potential that this shift in demographic represents. But in order to move beyond the platitudes of agreement of the need for youth involvement, SDSN Youth and TSIC sought to identify specific challenges that young people are facing in delivering solutions to the SDGs, and, building on these findings, suggest concrete opportunities for action that can leverage the contribution of youth-led solutions to sustainable development, and guide the support strategies of key stakeholders. And the key benefits of youth-led innovation for the SDGs and society at large. Such an approach will, we hope, enable us to consider the holistic impact to date of youth-led solutions to the SDGs, and by extension, allow us to support effectively both current and future efforts through targeted and informed responses. These four angles will be considered in more detail through this triptych of blog posts. A common thread exists amongst young innovators for the SDGs: they are invariably passionate individuals, with a determined vision to fill unmet needs and deliver positive change for the communities, societies and the world they live in. Additionally, young innovators are, at least initially, overwhelmingly motivated to design and run ventures that address problems which affect them and their communities directly. their aptitude for seizing existing opportunities. In the face of young people’s enthusiasm towards problem solving for sustainable development, there is a remarkable consensus on the factors that impede youth innovation – perhaps the most obvious of which is a relative lack of financial resources. Young social innovators consistently identified difficulties in accessing financial capital as the main barrier to progress, and this inevitably poses further challenges when it comes to scaling the solutions. Increasing funding, particularly at a local, grassroots level is essential to establishing and maintaining youth-led solutions, which often spring from resource-poor settings. Beyond this, several other factors were cited as significant hindrances to young innovators achieving their full potential. Notably, capacity-building and mentorship support opportunities were identified as lacking, especially with regard to overcoming prohibitively legal and complex regulatory frameworks, and building up essential business experience; tackling such issues from the outset would be a wise investment in the long-term self-sustainability of youth-led solutions. Relatedly, lack of exposure and visibility for young innovators was highlighted as an important barrier, as well as insufficient access to relevant networks, either due to social determinants such as poverty, illiteracy and rural isolation, or because of a lack of effective communication or awareness-raising campaigns. Finally, there has been an inadequate response to identifying the impact of geographical context on young innovators’ ability to develop solutions for the SDGs. Exacerbating this further is a lack of research on the effect of other social factors, such as gender or poverty, most likely due to the lack of available data on these, often disenfranchised and marginalised groups. Increased efforts should be directed at exploring the effects of different local conditions, and learn how a support strategy should be adapted to best fit these altering contexts: developing effective mapping tools, as suggested by SDSN Youth, could be one way of appreciating this contextual disparity, allowing for an appropriate adaptation of strategy . 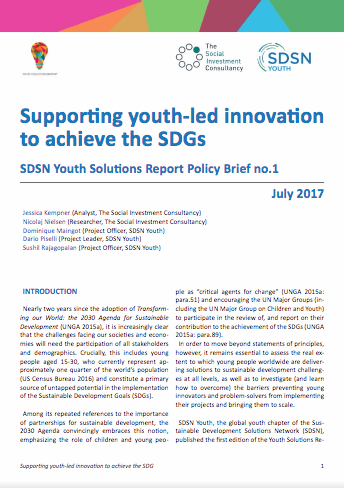 Much of the existing research on youth innovation for the SDGs begins with the premise that encouraging youth-led social enterprise is beneficial for its dual purpose of finding solutions to the world’s problems, while also solving the worldwide youth unemployment crisis, which currently stands at double the rate of adult unemployment. The ILO estimates that halving the youth unemployment rate would add 4.4% – 7% to the global GDP – a statistic that is difficult to ignore. But, in addition to direct economic gains, we would also see a reduction in expenditure to counter risky behaviour, violence and crime, as well as realising social benefits of reduced vulnerability and exclusion of young people. Thus, promoting youth-led innovation stimulates a shift in young people from social dependence to self-sufficiency, by enabling them to escape poverty and marginalisation and regain agency of their lives. Beyond filling gaps in the global labour force, there is of course the added benefit of the social aspect, which gives young people a sense of meaning and belonging, while creating a more engaged and sustainably-conscious global citizenry. Therefore, by engaging more young people in finding solutions to the SDGs, supporting them through challenges, and helping them exploit opportunities outlined, we effectively galvanise the younger generation in spearheading sustainable change. This post is a short summary of the first half of the policy brief, addressing the challenges and opportunities of youth-led solutions to the SGDs. You can read the full policy brief here. Stay tuned for the next post in our short series on youth innovation for the SDGs, which will look at the support needs of young innovators.